Meet the intriguing Peterbald Cat! Most know them as the Peterbald, though some still know them as the St. Petersburg Sphynx. However you were introduced, you will never forget these little Russian wonders of the cat world. Are they a hairless oriental? Are they Siamese? No! While some may have similar coloring, they are Peterbalds, and they have a look and a personality all their own! Fearless by nature, these intriguing cats approach strangers, dogs, and everything else with an inquisitive playfulness. They can be any color - from pointed to pink to tabby to spotted! They can be hairless, or they can have a short, brushy coat, or even somewhere in between. Want to learn more? Take a look around our site! If you have a question we didn't answer, just ask us! We love our Peterbalds, and we are sure that you will love them, too! Congratulations to RW SGC Mercuyhold Stepan of Shamira, TICA's FIRST male Supreme!!! Here we are just after making his last final! Who could buy a cat online? For those of you who have been looking for a while, this may not seem to be such a foreign idea. No matter how long you have been looking, it is not a task that we think is easy or to be undertaken lightly. That is why you will notice a real difference when visiting Shamira's virtual home here on the web - tons of photos, frequent updates, and quick responses to your Email inquiries. 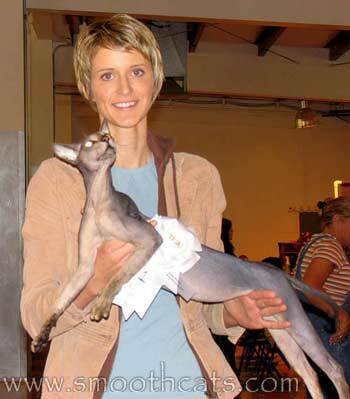 When I began researching cats online, I was very frusturated with the distinct lack of information and the low quantities of poor photos available on most breeder's sites. 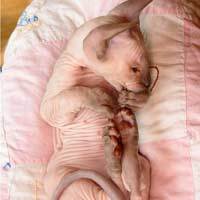 Realistically, because of the 'specailty' nature of hairless cats, most kittens are placed in homes that are found through the Web. I endeavour through this website to offer information and enough quality photos that you can practically personally inspect each of my cats. Why do I go to this length? Because that is the way I would like it, and I am confident that you will appreciate the difference that is apparent when you choose to work with Shamira! So, take a look around, and let me know what you think! I look forward to hearing from you!